When you need a Sagamore roof cleaning and pressure washing professional, you want to be sure that you are getting the best of the best. 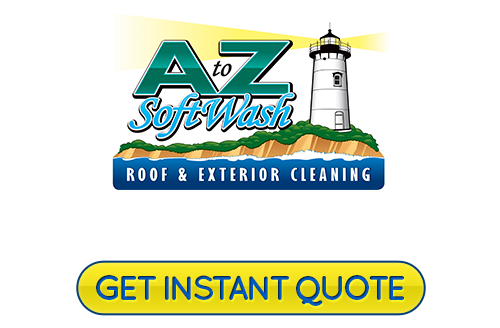 This is why so many people rely on our team here at A to Z Softwash. With many years of experience, we are honored to have established ourselves as the local leading service provider for this type of service work. Contact us today for an instant quote. Taking care of cleaning your roof is an important task that needs to be done. However, too many will approach the job all wrong. This is not the type of job you want to do with extreme pressure washing or you could end up doing more harm than good. When high-pressure water is used, it may remove the dirt and lichen that are making your roof look bad but it will also damage the roof. Then, it is vulnerable to water which will get under the shingles and lead to rot. The system we use is a soft wash technique that cleans and sanitizes without posing any threat to the building materials we are working on. With roof cleaning, soft washing is very safe and effective. This is the ideal approach to cleaning all types of roofing systems including asphalt shingles, tile, cedar shakes, and more. Don't take chances when it comes to cleaning the most important feature of your home. Let us take care of your roof cleaning in Sagamore. Once the exterior of your home begins to look dirty and rundown, it takes away far more than just the curb appeal. It also lets the grime and other substances damage the building materials of your home and landscape and detracts from the overall property value of your home. Yet using a harsh cleaning method will have negative effects. 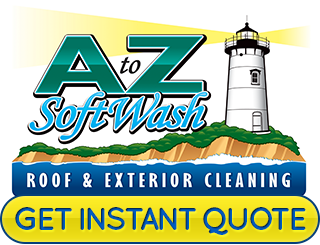 So when you are in need of Sagamore pressure washing, trust in our soft washing experts at A to Z Softwash. 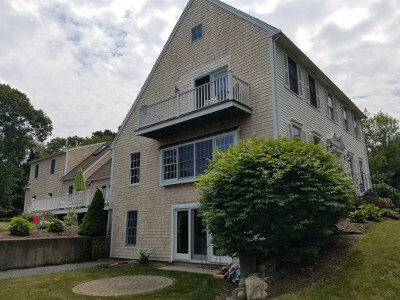 If you are looking for a Sagamore, MA roof cleaning and exterior soft washing expert, then please call 508-209-7795 or complete our online request form.